In the last years of his life, the fantasist Charles Dodgson wrote a third Alice book. This mysterious work was never published or shown to anybody. Well, that’s not quite true. 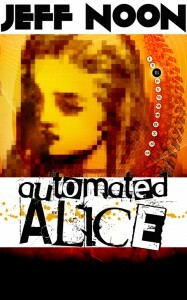 Automated Alice was written by Lewis Caroll, Lewis Caroll was the nom de plume of Charles Dodgson. No, that’s not even slighly true either. Automated Alice was written by Zenith O’Clock, the Writer of Wrongs. Oh dear, that’s not at all right. This book was written by Jeff Noon. Zenith O’Clock is only a character invented by Jeff Noon. What Alice encounters in the automated future is mostly accidental: mutant hybrids, sinister gameplay, chaos theory, a robo-Alice, quantum physics, computermites, jigsaw killers, tickling vurt feathers, puzzle poems and an invisible cat called Quark.